I was shocked and saddened when Prince died on April 21, 2016. I bet you were, too. An incredible talent like his is rare indeed and the world cried purple tears that day. As a former Minnesotan and huge Prince fan, I am sorry to say I never got a chance to see him in concert. I let the high cost of tickets keep me from fulfilling that dream. But I wasn’t going to miss a chance to visit Paisley Park, where Prince lived, worked and recorded dozens of albums. 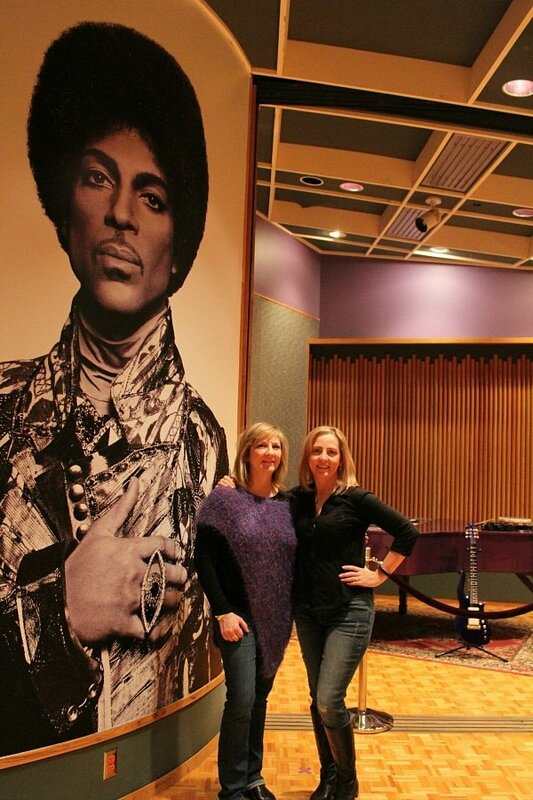 Here’s what it’s like to tour Paisley Park. Just six months after Prince’s death at Paisley Park, his residence became a museum open to the public. This facility began construction in 1986 and concluded one year later. Much of it was designed by Prince himself. As much as possible, the museum’s owners and management have tried to keep Paisley Park exactly as it was before Prince died. 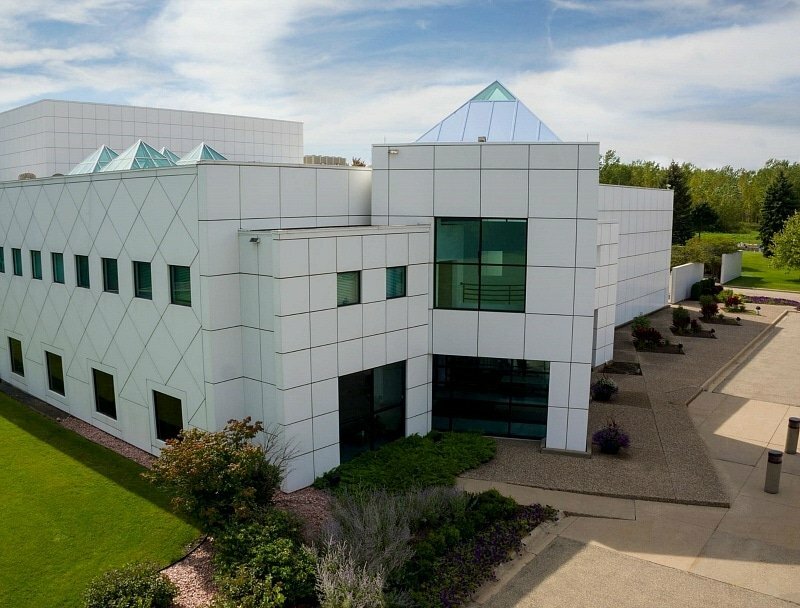 Paisley Park is a behemoth white block building along an unassuming road in a Minneapolis suburb, Chanhassen. 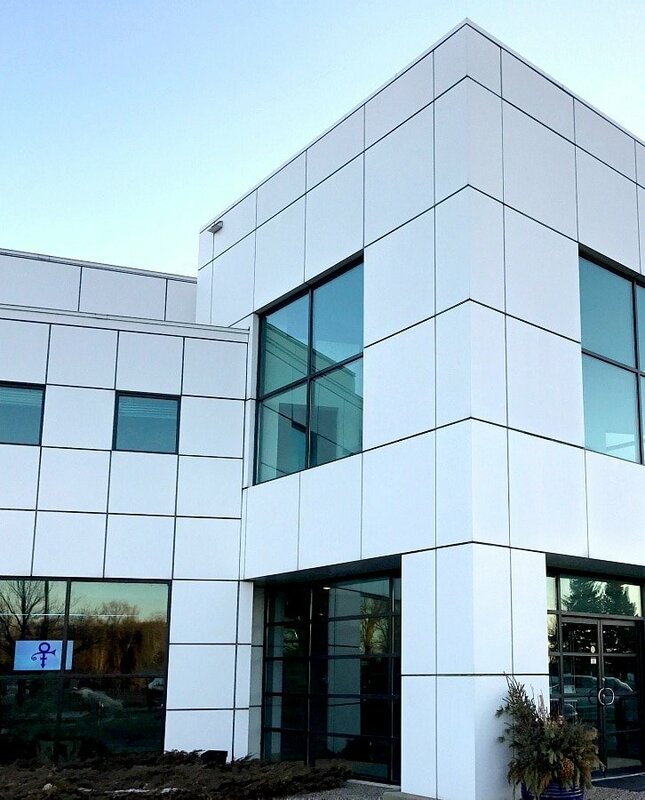 It looks more like an office building than the place where an uber-talent like Prince resided, recorded dozens of albums, and hosted private concerts. 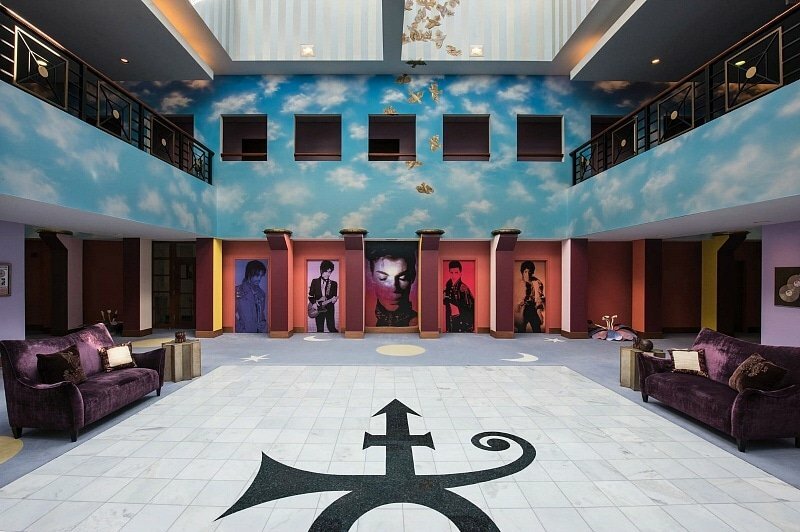 Prince wanted a space that would function seamlessly as a work and living space, with recording studios, offices, and concert spaces all under one roof. 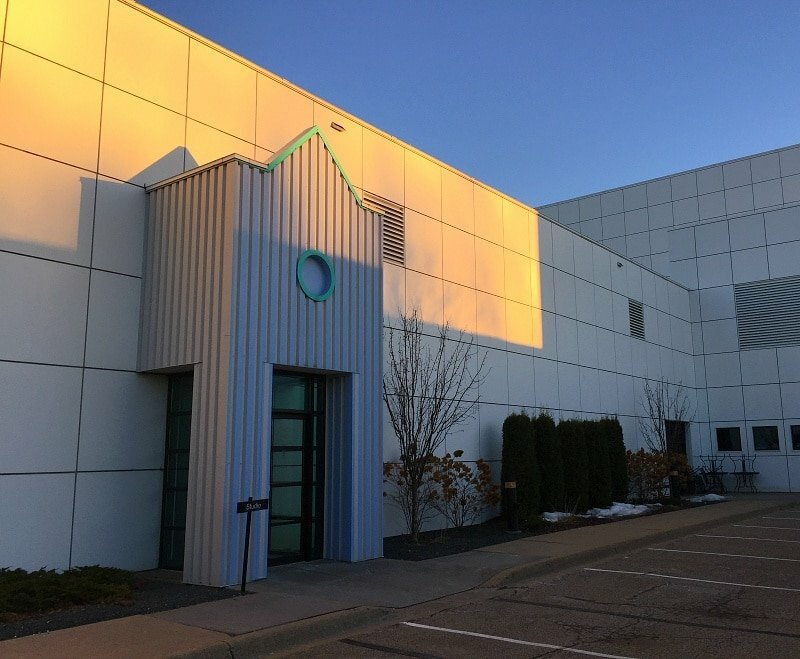 Before he passed away, there were about 50 people employed at Paisley Park including security staff, wardrobe, assistants and other employees. The rules at Paisley Park remain the same as when Prince lived here. No cursing. No alcohol. No smoking (even in the parking lot!). No meat besides fish and seafood. So, leave your baloney sandwich at home! Paisley Park is located 22 miles from downtown Minneapolis and 17 miles from the Mall of America. Be sure to purchase your Paisley Park tour tickets online before arrival. You can’t buy tickets on site. Enter the Paisley Park lobby through glass doors and check in at a curved receptionist desk. After showing your tour reservation tickets (printed or on your smart phone), you will need to turn in any cell phones. Staff will place your phone into a little pouch that locks. Unfortunately, no cameras of any kind are allowed during the tour. You can unlock your smart device after the tour so you can take photos of a hallway filled with posters, many of which you will see in this post. Prince hated cell phones, so it makes sense that they would be forbidden during the tour. Touring without a cell phone or camera forces you to live in the present moment, just like Prince did. Next, you step into an open two-story square lit by huge pyramid-shaped skylights. At night, they emit a purple glow to the outside world. Sky blue walls are dotted with painted puffy white clouds and doves in flight toward the heavens. Perched below the skylights is a miniature replica of Paisley Park inside which are Prince’s ashes. Surrounding the tiled space is carpeting featuring images of the sun, moon and stars. The room’s curved columns create different patterns, depending on the angle from which they are viewed. 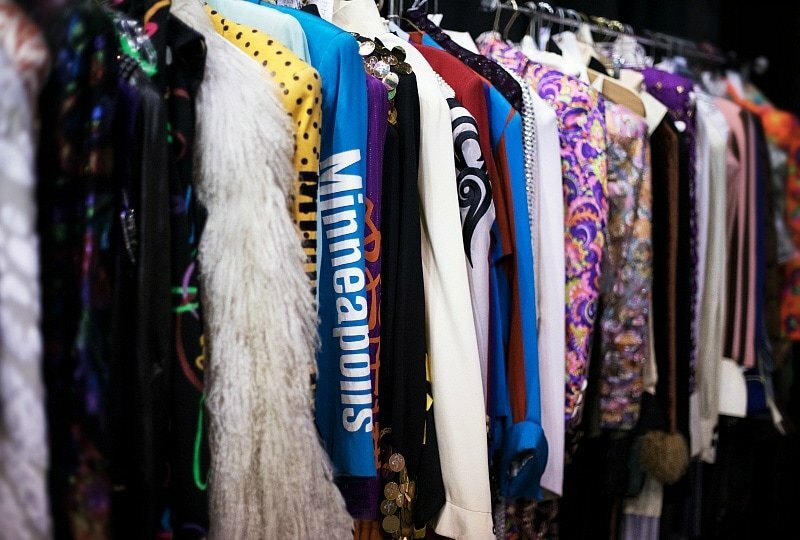 Prince wanted a combination of colors and shapes at Paisley Park to represent the multifaceted aspects of his music, movies and other artistic endeavors. Along one wall of the indoor courtyard are alcoves that were closets during Prince’s lifetime. Today they act as display cases, showing off Prince’s unique clothing and cloud guitars. Prince designed his signature cloud guitars himself and had them made by a local company. Along one wall of the indoor courtyard sits the Little Kitchen. It contains two diner booths beside a small wall kitchen. A plush crimson couch on one side of the room is where Prince liked to sit to watch his favorite movies like Some Like It Hot on a large screen TV. He also watched basketball games here. Prince was a huge fan of the Minnesota Timberwolves and the WNBA Lynx team. Fun fact: all five-foot-three-inches of the artist played on his high school basketball team. Three offices stretch along another wall of this courtyard area. Portions of Prince’s personal office have been roped off, but otherwise it has been kept as he used the space. Prince was an Egyptian history buff and a large art piece with Egyptian symbols hangs on one wall. A purple landline sits atop Prince’s desk. A tall, old school CD holder contains some of his favorite music by artists like Joni Mitchell and Sly and the Family Stone, as well as some of his own albums. Next up is Prince’s video editing bay. Here you’ll take a seat on the golden-colored carpet to view some of the music videos Prince edited here at a curved electronic console. Behind that is a large purple couch and an unassuming glass coffee table. Despite his larger than life persona, many of the furnishings look plush and comfy rather than ostentatious. Studio B is the only place where you can have your photo taken inside Paisley Park. For an additional fee at check-in, you can purchase a thumb drive on which the photos will be added. 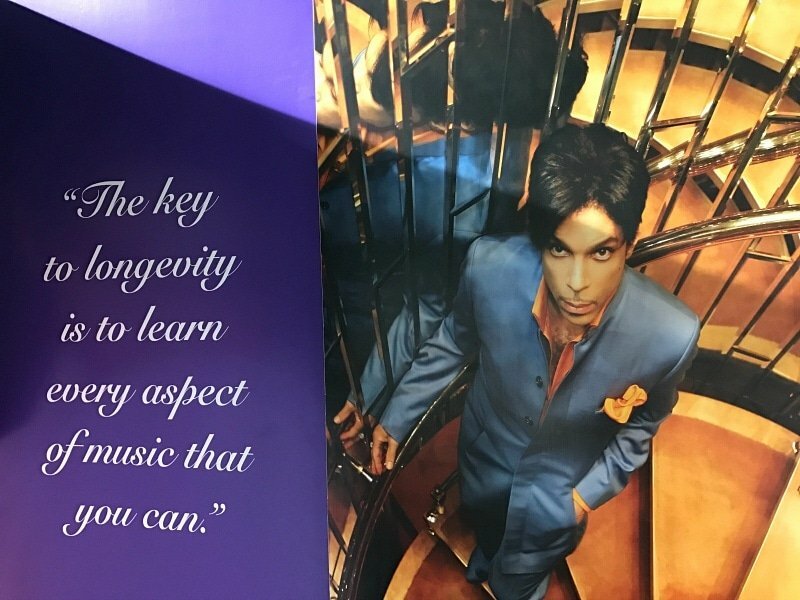 You’ll pose in front of what appears to be a purple baby grand piano, but which has actually been outfitted with an electric keyboard. Note: this is only offered to VIP Paisley Park tour ticket holders. A ping pong table sits across from the piano. Prince was a great ping pong player and loved to challenge fellow musicians to a game. The best part? You can play a round or two here on the very same table where Prince played! Studio B utilizes analog recording, as do all three of the music studios at Paisley Park. 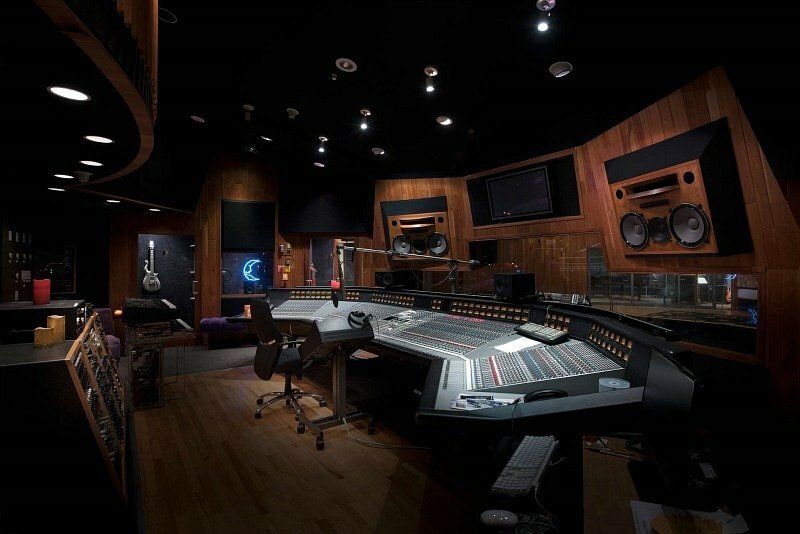 This studio also includes a vintage DeMedio Console, which Prince had special ordered. Before entering Studio B, there is a small room with a love seat for relaxing after recordings. The Galaxy Room, as it is named, is lit by black light to make neon images of stars and planets glow bright on dark walls. Next you’ll visit Studio A with its parquet wood floor and granite-walled control booth. Many famous singers recorded in this room, including James Brown, Aretha Franklin, Celine Dion, Madonna and R.E.M. You’ll see some half-melted candles in the control booth, where Prince sang his own lyrics. Most recording artists typically sing in a smaller, soundproof recording booth. Prince, however, acted as producer on all 39 of his albums and therefore had to remain in the control booth. In Studio A, we were treated to a sampling of yet-unreleased music recorded by Prince prior to his passing. 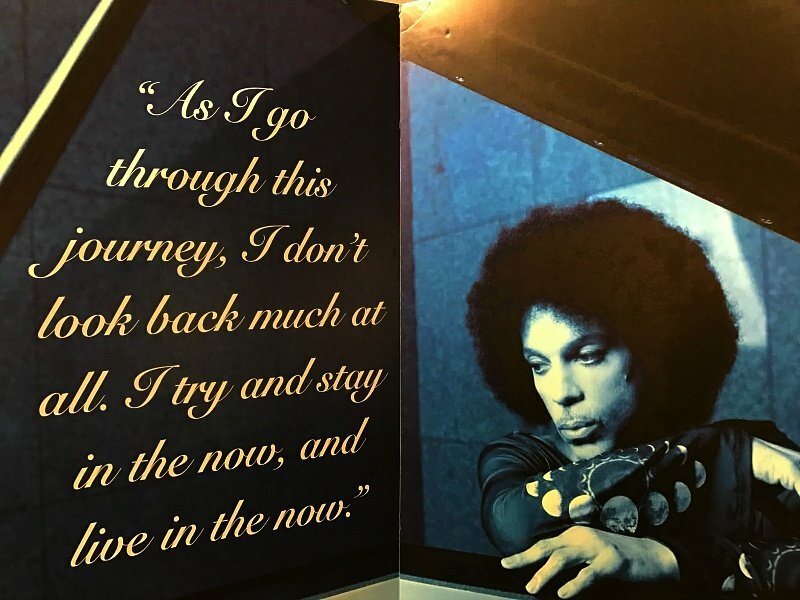 The hallway outside Studio A contains a long sunset-colored mural that Prince had commissioned. On the left you’ll see images of artists that Prince influenced, like Lisa and Wendy from The Revolution, Cat Glover, Apollonia, Vanity 6, Morris Day and The Time, Sheila E. and Kenny “Babyface” Edmonds. 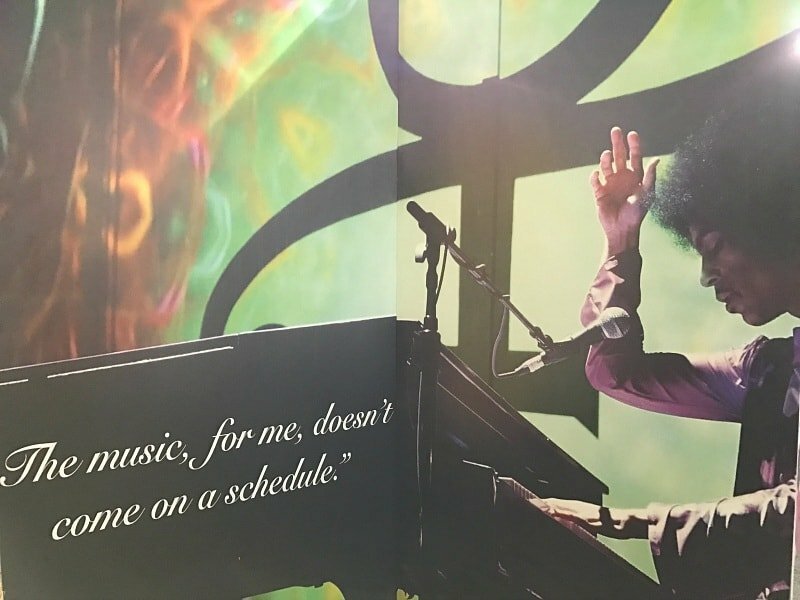 The right side of the mural depicts the artists that greatly influenced Prince, such as Stevie Wonder, Jimmy Hendrix, Carlos Santana and Chaka Khan, among others. A room once used as a dance rehearsal space/basketball court has been transformed to celebrate all things Purple Rain. It still features the wood floors and mirrors used by the dancers, but the single basketball hoop has been removed. 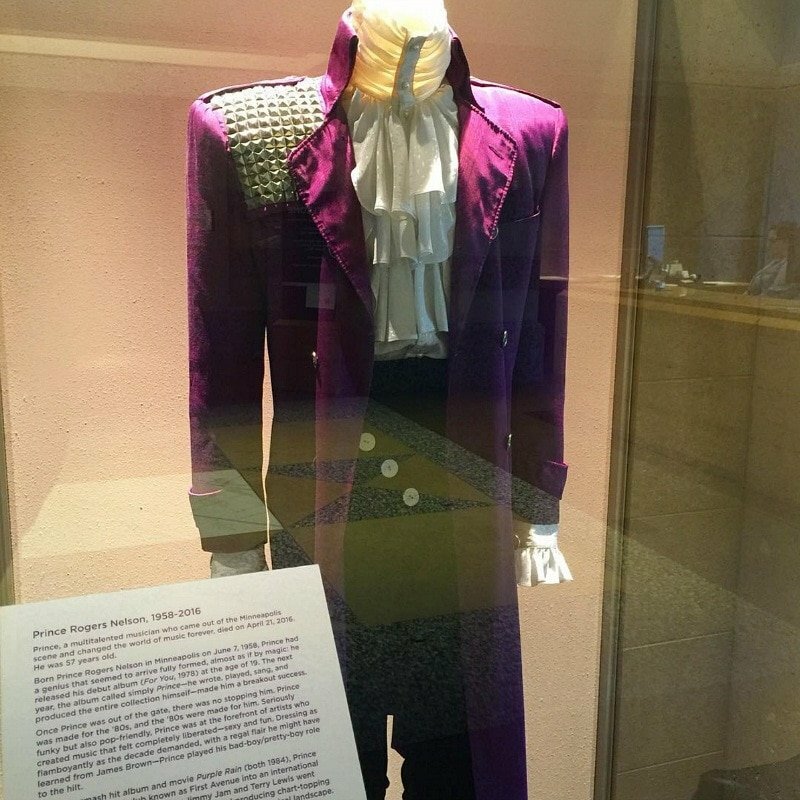 While the movie Purple Rain plays on a mounted flatscreen TV, you can look at memorabilia from the beloved Purple Rain movie, album and song. 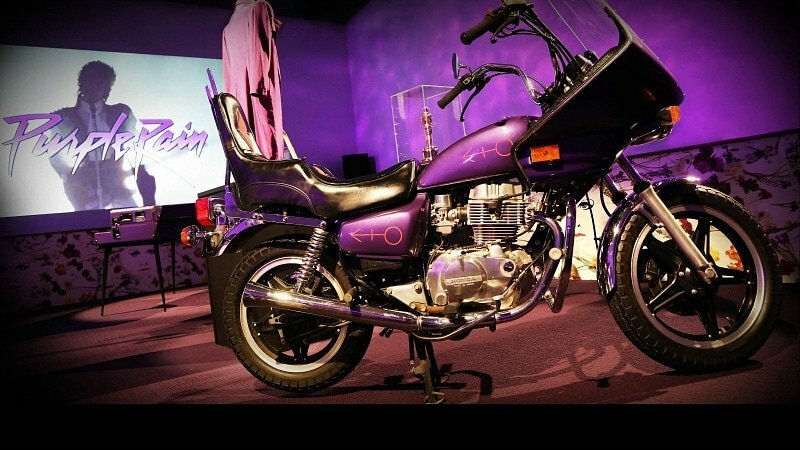 You can also view Prince’s Oscar for best movie soundtrack, his purple jacket and white puffy shirt worn in the movie, his bound Purple Rain script filled with his personal notations, a white cloud guitar, and one of the three motorcycles used in the movie. While touring this room, take a look at the top of the upright purple piano with electronic keyboard inserted. Prince famously danced atop pianos during his performances and jumped from them. (These jumps may have contributed to his hip surgery and subsequent opioid addiction and accidental overdose). You’ll see scuff marks on the top of this instrument, caused by Prince’s own high-heeled boots and shoes. In the adjoining room, you’ll see memorabilia from his lesser known movies, Under the Cherry Moon and Grafitti Bridge. Smaller than the Purple Rain Room, this space was also once used as a dance studio. It has been split in half, separated by different flooring and lighting. The Arcade Room is so named because this is where Prince used to play stand-up arcade games back in the day. Today it is filled with an unusual yellow couch, oversized sculptures of flowers (think Georgia O’Keefe), and a Schimmel Pegasus piano with a hydrolic lid inscribed with Prince’s symbol. 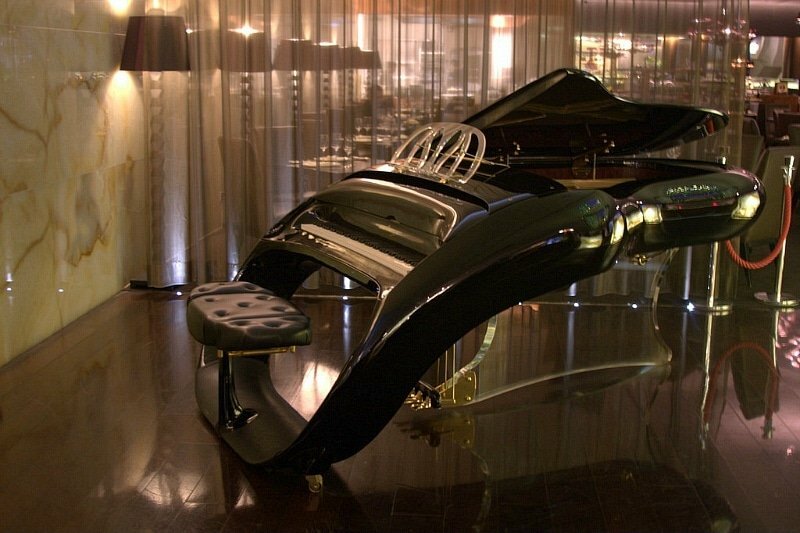 He paid over $100,000 for the piano in the 1990s. Graffiti Bridge, sequel to Purple Rain, was filmed almost entirely in the 12,240-square-foot soundstage at Paisley Park. Other clients who used the space for filming or rehearsal include Grumpy Old Men (the movie), McDonald’s, Porsche, and the Muppets, among others. 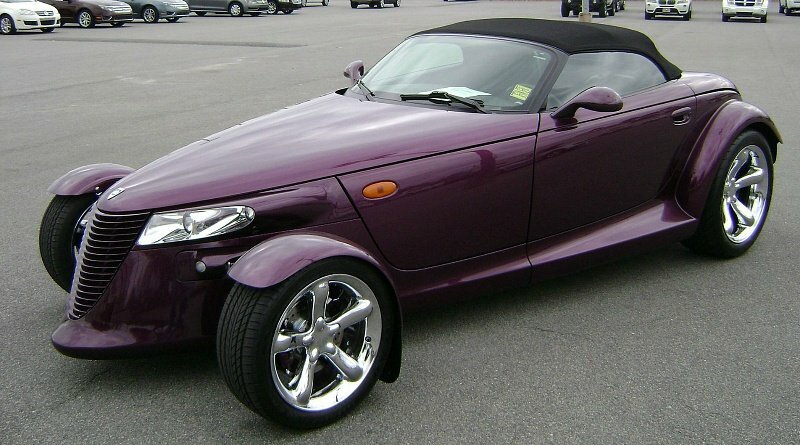 Two of Prince’s cars are on display in this vast space: a powder blue Bentley and a purple Plymouth Prowler. Prince used to jam out in the NPG Music Club for and with fellow musicians and celebrities. He also invited local fans to come for free concerts here. Often he would not make an appearance until 2 or 3 in the morning. Sometimes, if he wasn’t feeling the vibe, he wouldn’t show up at all. Instead, he’d play one of his favorite movies, like Finding Nemo, on a huge movie screen to entertain those seated in the cushy curved purple booths. Today this space is used for brunches on Sundays, dance parties with a DJ on Friday nights, and movie screenings on Saturday nights. I attended the brunch and ate scrambled eggs topped with a unique spice (think Moroccan flavors), s’mores French toast, and a Hasselback potato. You can also order from a menu of Prince’s favorite dishes from a menu to eat on-site or take to go, like coconut curry with black rice and chickpeas, and macaroni and cheese. 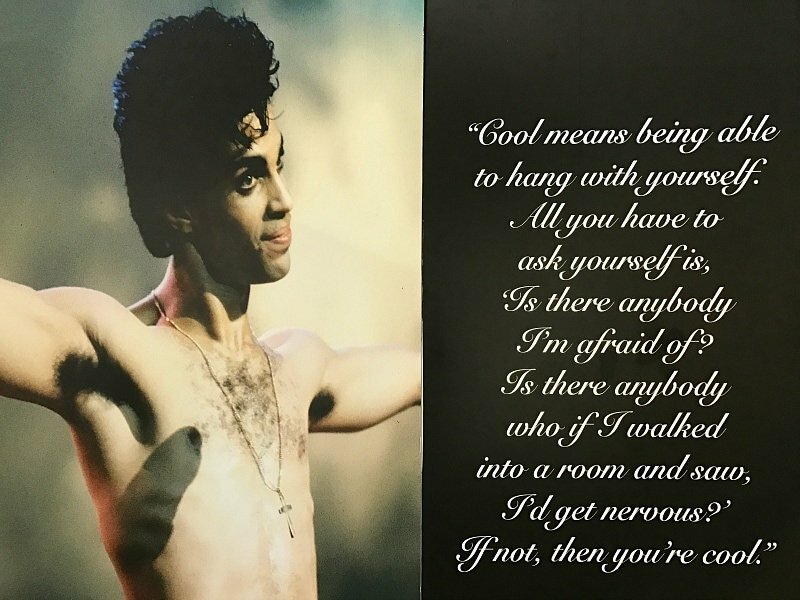 In the days, weeks and months following Prince’s death, fans from Minnesota and far beyond brought notes, artwork, and handmade gifts to Paisley Park. Prince loyalists left these in and beside the fence surrounding the property. The Paisley Park Museum has collected every single item left in Prince’s honor. A portion of a fence is displayed in the store along with the fans’ memorabilia. 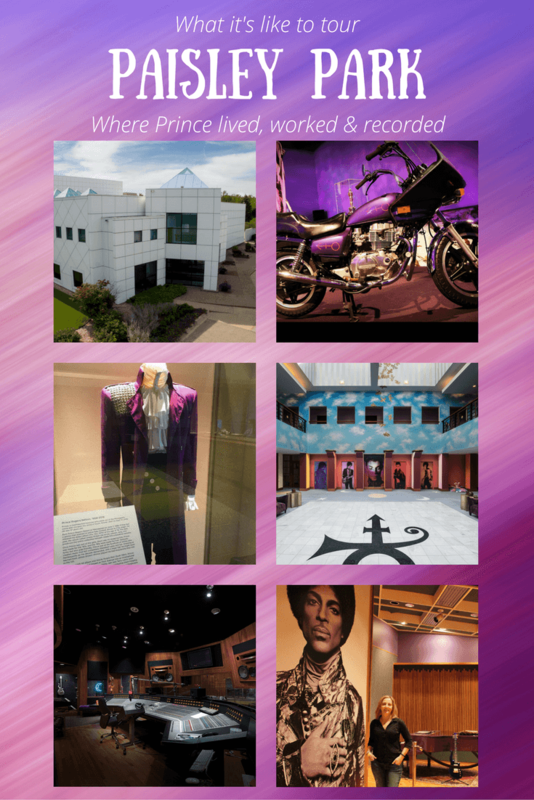 The items are rotated so that everything can eventually be shown to Paisley Park visitors. You can buy all sorts of souvenirs celebrating The Purple One at this store, including Prince’s favorite vegan peanut butter crisped rice treats, purple guitar picks, and concert t-shirts and posters. 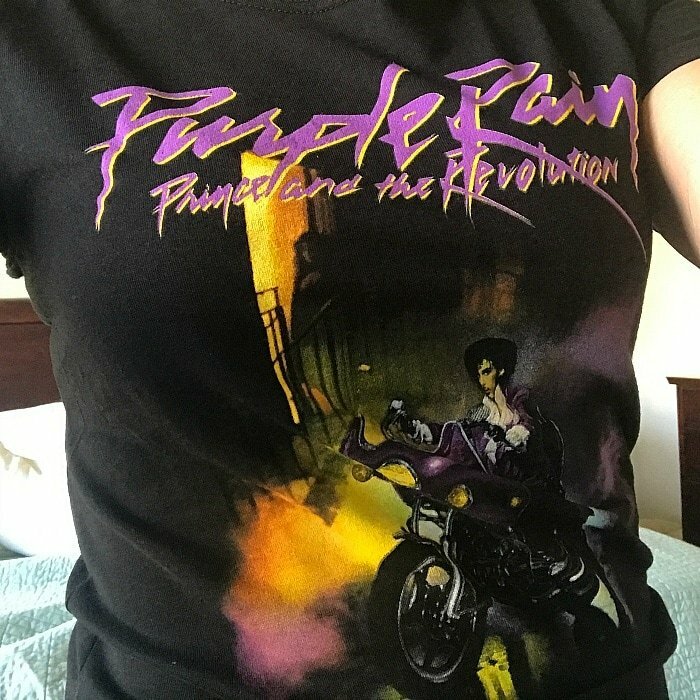 I couldn’t help myself; I bought Purple Rain t-shirts for both my husband and myself. After college in the Southwest, I returned to Minnesota for four years, where I went on a first date with a charming guy to First Avenue. Known to locals as First Ave, that’s where Prince launched his music career and put Minneapolis on the music map. A couple of years ago, that same charming guy (who’s now my husband) and I considered buying tickets to a Prince concert. But at a couple hundred dollars a pop, we resisted our musical urges and stayed home with our kids. It’s true what they say about regrets. It’s the things you didn’t do that gnaw at you more than those you did. You can no longer see Prince play live in concert. 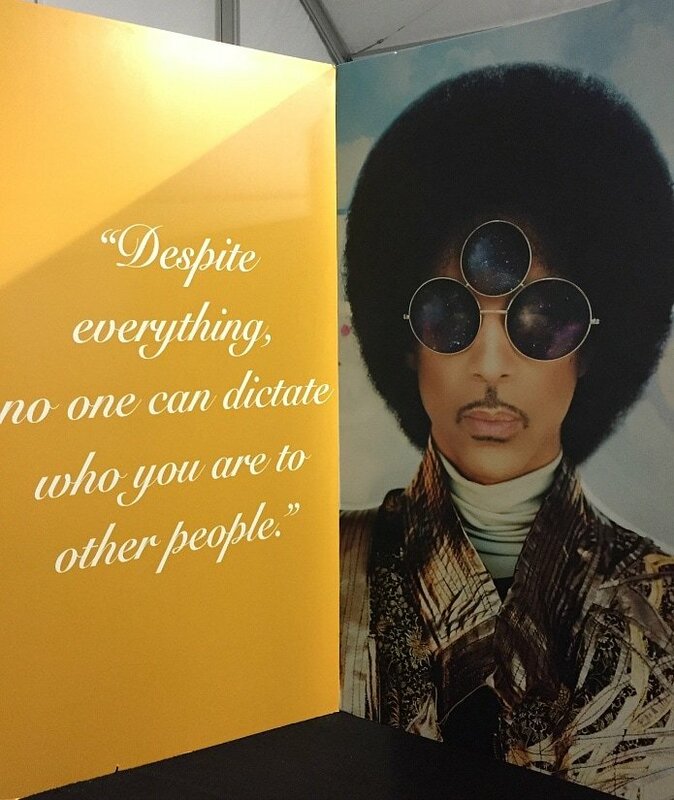 But you can go get a glimpse into the mind and life of this music icon during a Paisley Park tour. You need to make reservations to visit Paisley Park. You can buy the standard ticket but I suggest getting the VIP tour for additional access and information, as described in my story above. You won’t regret it. Do you love Prince as much as I do? Take a musical stroll down memory lane by listening to Prince’s The Hits/The B-Sides or watching Purple Rain, Under the Cherry Moon and Grafitti Bridge. Would you like to tour Paisley Park? Let us know in the comments below! A Note from The Travel Mama: I did not receive any comps or media discounts to tour Paisley Park. This story includes affiliate links. Your clicks and purchases help to keep TravelMamas.com a free resource for readers like you. That is so incredibly amazing. He was such a creative artist, and Paisley Park shows that. Even his living and recording areas exude that classic “Princeness”. It definitely felt uniquely Prince-ish at Paisley Park! Thank you for the review and glimpse of what is behind the regular looking building. I’ve driven by it several times over the years and hope to take a tour of it at some point. Kristi – I hope you’ll go for a tour someday. If you drive past it often, it would feel very much like peeling back the curtain on the Wizard of Oz – intriguing. I always loved Prince’s music. I’d love to get to do this tour to take a deeper look at his life. Since you’re a Prince fan, I’m sure you’d enjoy Paisley Park! I really like Prince’s music! It would be such an experience to tour Paisley Park. My husband and I were devastated to learn of his death. His music will definitely live on forever. I would love to visit Paisley Park one day. Oh, I hope you can visit someday, Jaime! It’s cathartic in a way. It’s so cool that you’re able to explore so much of Prince’s world! The recording studio he used was super impressive! Prince was not kidding around when it came to music! This is just awesome. I am big fan of Prince. He is such a musical genius. I love that he stood for what he believed in and served as an inspiration to budding artists everywhere. Thank you for taking us on a virtual tour of Prince’s residence. I wish I could visit the place someday too. He was such a musical inspiration for people of all ages. I hope you can visit Paisley Park someday! I hope you can visit Paisley Park someday too! This is seriously so amazing! I would love to visit Paisley park. As much as i loved Prince, there were so many things i didn’t know about him. Prince was such fascinating person! It was so interesting to get to learn a bit more about him. Prince is an icon and it would be amazing to get to experience this tour. I love that it’s very detailed and you will see everything that there is to know about him and more. It’s worth it! Thank you for your comment, Amanda! I took some crazy detailed notes at Paisley Park! Looks really neat. I had no idea you could tour or visit it. Would be something neat to explore, I wasn’t much of a fan but it would really be neat to see anyways! That’s how I feel about Elvis’ Graceland! Prince was truly an amazing artist! Your trip is certainly enlightening for me – I love all your pictures. Thank you, Seattle Travel Blogger! Yes, I would love to tour Paisley Park! Prince was such an amazing artist and he truly was one of a kind. I hope you get a chance to tour Paisley Park someday soon, Jocelyn! How awesome! I truly hope to get to tour there someday. The entire place looks and sounds so amazing! I hope you can visit Paisley Park someday soon, Makeba! I bet it was amazing tour. Seems like he took a lot of time and effort to make home his happy place. Rosey – Prince definitely thought through the details at Paisley Park. I was surprised, though, by how old school/homey some of it seemed. I mean…a CD rack?! Prince was such a talented musician. It was a shame that he passed away so young. I didn’t even know his house looked so modest. I would love to tour it myself someday. Paisley Park was modest in some ways and outrageous in others…definitely interesting! OH I didn’t know this existed!!! My husband is pretty much obsessed with Prince and would love to visit! Reesa – I hope you and your husband get a chance to visit Paisley Park together someday! Christina – How wonderful that you are planning a trip to Minnesota to visit Paisley Park. Since you are a super fan like me, I am sure you will really appreciate and enjoy touring the space where he lived and worked. Prince is so missed by us all! You are right, Ella. I don’t know how I got that wrong. Thank you for pointing this out to me. I have corrected the story. I enjoyed your article. I am attending the celebration in April 2018 and very excited to experience PP. like you I never got to see him preform live, so I am really looking forward to this trip. I will update you upon my return. I hope you enjoy touring Paisley Park as much as I did, Marilyn! Can’t wait to hear your thoughts!